Fun with Vyatta and home routing! Good day my Internet friends! Let me say that I feel accomplished – and not just because I got out of bed this morning, although that is a big win for me. No, instead I’ve actually been quite productive (based on my standards, anyways). I’ve been rebuilding my home test lab for the past couple of days before I start my new job. What I really wanted was to get back heavy into the NetApp DataONTAP simulator, but I wanted to get inter-VLAN routing working first so I could have some realistic networking. I only have layer 2 switches in the lab so I was looking for ways to accomplish this. I reckon I knew I would have to use software of some sort, but I hadn’t actually messed with anything up to this point. I’d heard of the Vyatta virtual router recently, so I thought I’d give that a try. You can download the free community edition here with a login: http://www.vyatta.org/downloads I wasn’t able to find the Vyatta virtual appliance I saw advertised around the interwebs, but I was able to install from the LiveCD ISO just fine. Before I get too far, let me explain why I’m even writing this post. There has been a lot written and blogged about with regard to the Vyatta virtual router. There are many configuration examples and the vendor documentation is quite good. But I came across a few things that seemed unique to my environment or at least that hadn’t been blogged about yet (or if it had, I couldn’t find it and had to *sniff* go it alone). Let me share with you the final configuration with this diagram. What interesting parts are within the VMware Workstation installation on the laptop and of course, the Vyatta configuration itself. For a more complete picture of what I’m trying to accomplish, I’ve included the physical ESXi hosts on the far left. 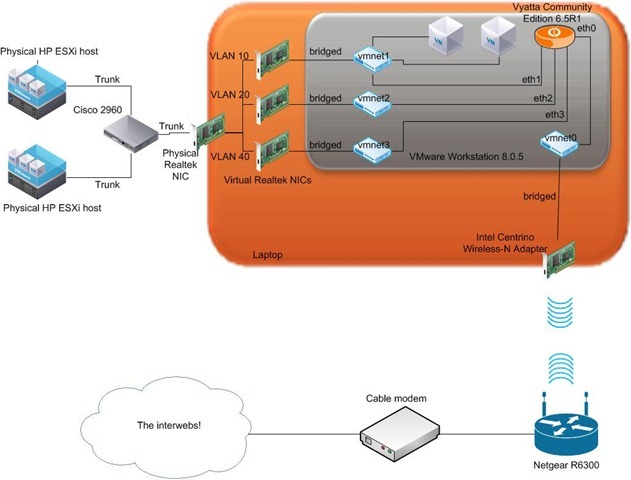 The connections leaving the ESXi hosts are 802.1Q trunked with management traffic in VLAN 10, VM traffic in VLAN 20, and storage traffic in VLAN 40. The storage traffic is only trunked out these interfaces for management purposes because my Iomega ix-2’s only have one interface each which must be used for both storage and management traffic. The backend storage network is not shown in this diagram. A trunked link also leaves the 2960 switch and terminates at a 1 Gbps NIC on my administration host, an HP laptop. This laptop is running Workstation 8. Along with the physical NIC, the laptop has an 802.11n wireless adapter. This connects to a Netgear R6300 retail wireless router. The Netgear, then, connects to an ISP-provided cable modem and out the internets. As a note, here is the final Virtual Network Editor configuration inside Workstation. 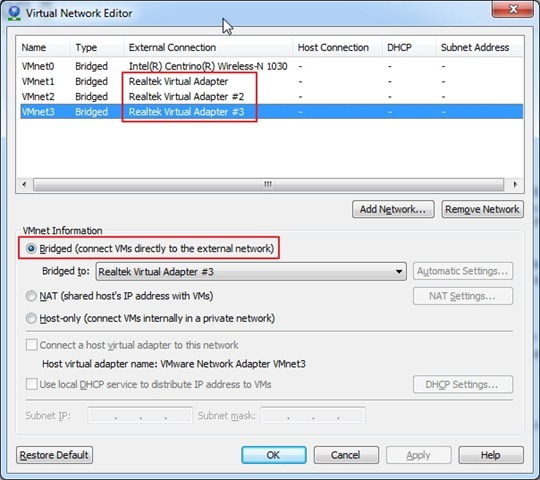 Each vmnet is bridged to either a virtual Realtek adapter (detailed below) or the wireless adapter. Be sure to save your Vyatta configuration often by committing it to NVRAM with the commit command. While trying to figure out how to use VLANs with my lab setup, I came across a forum thread that mentioned using the Realtek Diagnostics Utility to configure VLANs. You can find it here: http://bit.ly/dmUWE2 and look for the Windows Diagnostic Program. This utility is pretty cool. It reminds me of VM-FEX (I know they’re different, though) in that it creates multiple virtual adapters from a single hardware device. This may be one of the few ways to use VLANs on a machine with a single physical NIC port. I downloaded the 6.5R1 ISO. One simple installation note I missed (because I didn’t RTFM) was, well, how to install it. Simply run the following after you boot from the LiveCD. Login is vyatta/vyatta. One thing to note was that it was useful to add one vNIC at a time to the Vyatta VM. This way, as I add a vNIC, it gets labeled in VMware Workstation sequentially, as in: Network Adapter, Network Adapter 2, Network Adapter 3, etc., and Vyatta then installs them sequentially as eth0, eth1, eth2, etc. I made the mistake of adding four network adapters at one time and then booting the appliance. I assigned IPs and configured the router as I wanted, then was troubleshooting for hours until I realized that Vyatta had simply assigned the adapters as it found them at boot time which was not necessarily the order in which they were installed or labeled in the VM itself. So, save yourself some headaches and add one vNIC at a time with reboots in between. Here’s my minimal configuration of the Vyatta virtual router. I’ll point out the bits that took me a while to figure out and were crucial to getting this working. The full Vyatta config can be seen at the bottom of this post from the output of the show config command. From here, you can SSH to your management interface. Set up the rest of your interfaces. Configure your domain name and DNS servers. So with this configuration, let’s take a closer look at how our networking is configured. So from here, what we need in order to route traffic from VLANs 10, 20, and 40 to the Internet, we need to configure two things on the Vyatta router: a default gateway and NAT. I guess I should have whiteboarded it beforehand and saved myself some time. Going back to my CCNA days, I realized a default gateway or static route alone won’t work because once traffic is routed across the Vyatta, the source IP addresses are still 10.10.x.x. Even if the Netgear forwarded the packets, the source IP isn’t known by the cable modem (and therefore wouldn’t be NAT’ed) and certainly won’t be routed out into the fuzzy-kitten-video-verse. This was the last thing I realized and the final piece to the puzzle. I needed to configure NAT at the Vyatta so the Netgear could then use its own default NAT scheme. 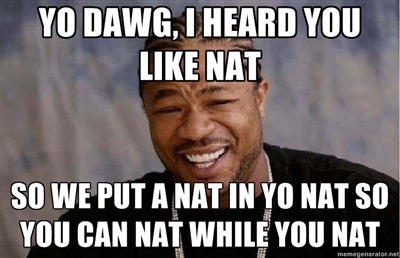 Configuring NAT is pretty easy. There are several types of NAT, of course, so choosing the appropriate one is important. 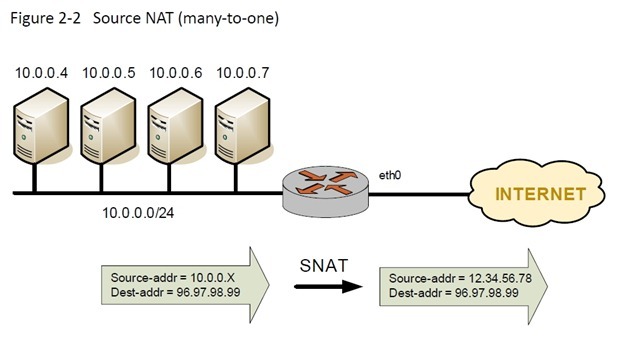 In my case, I wanted to dynamically NAT three inside source subnets to a single outside IP address, the eth0 IP address. This configuration is called Source NAT (many-to-one). From the Vyatta NAT documentation, here’s generic diagram of what we’re going to configure. My configuration steps follow. 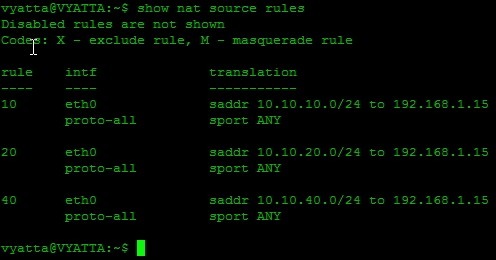 These four commands are repeated for each inside subnet. NAT rule 10 corresponds to VLAN 10, rule 20 to VLAN 20, and rule 40 to VLAN 40. An alternative to specifying a translation address is to use the masquerade keyword. This will replace outgoing packets with the primary IP address of the outbound interface. In my case, I could have also used masquerade because eth0 only had a single IP address assigned. And that’s it. Test connectivity to the Internet. VMs running in both Workstation and the physical ESXi hosts will have Internet connectivity. This was a big win for me because I spent so much time on it. You can be assured there was much fist-pumping, back-slapping, and high-fiving of one’s self after figuring this out. If you ever need a second job, you should look into writing tecnical manuals. Thanks for the kind words, but I doubt I’d enjoy writing about such boring things. Can you 192.168.1.x ip addresses ping any of your 10.x.x.x addresses, including the 10.x.x.x. addresses on vyatta itself? Bascially, can devices coming through your wireless network ping the 10.x.x.x addresses? Yes, everything could ping everything else in the lab. The one exception is that I didn’t configure any port forwarding on my firewall so I couldn’t manage anything from the outside. But inside, everything in all networks could communicate. The Vyatta, as you know, was providing the routing between networks. From your Vyatta, can you ping devices on each network? All my devices that are vm instances (172.16.x.x devices) can ping my 192.168.41.x. router and reach the internet. No nat is involved becase my router is doing that. My switch (192.168.41.x) and my router (192.168.41.1) cannot ping inbound to the 172.16..x.x vm instances or even the 172.16.x.x vyatta addresses. They can reach the vyatta 192.168.41.x vyatta address of course. I used tcpdump as well to look for packets coming inbound on eth3 but no luck. I bet you need to add static routes to anything that needs to reach behind your Vyatta. Everything in your 192.168.41.0 network will likely have it’s default gateway or default route configured to be 192.168.41.1, your Internet router. When you ping something behind your Vyatta, the device you’re pinging from doesn’t know about the network you’re pinging. As you know, if a device doesn’t know how to reach a certain network, it sends it to it’s default gateway or default route. If you want devices to hit the Vyatta from the 192.168.41.0 network, you need to either add static routes to every device that lives in your 192.168.41.0 network or possibly add static routes on your Internet router to point back to your Vyatta for every network that sits behind the Vyatta. Does that make sense? Yea, I do understand and I have done all that already. Don’t forget the 172.16.x.x. devices can reach the internet so the router/devices know the path back. It’s just going outbound only. I will recheck EVERYTHING today. Just weird stuff. Do you have RIP configured on the Vyatta and your Internet router? Any routing protocol would do. which sends/receives 802.1Q tagged packets. An in that case how would we configure an interface in vyatta to be used as trunk? And use that trunk to carry tagged information packets of all three VLANs to other end (in your case the Cisco 2960)? Thanks for your comment. Excellent timing, my friend. This post is 1 year old today! I remember the late nights that went into figuring this out with fondness…I wrote this with the intention of getting back up to speed with NetApp for my new gig. Turns out my new gig has panned out really well. I’ve done a few NetApp deployments, along with Cisco UCS and VMware’s SRM. So I’m tracking with you on what appears to be a mistake in language. The configuration above does, indeed, use VLANs. The ESXi hosts were using tagged port groups (not shown in this post). But with your question, I looked at this config a bit closer. The way I configured the Vyatta, it does not use VLANs. But I don’t know where the VLAN tags are being stripped off: at the Realtek Virtual Interfaces or at the Vyatta interfaces. If the Vyatta receives a 802.1q tagged packet on an interface that is not configured for a VLAN, will it simply strip it off, ignore the tag, and route the packet accordingly or will it drop the packet? I don’t know and for now, I’m not going to test. Do the Realtek Virtual Interfaces strip tags? I don’t know. Wireshark could tell you though. And voila! You have a single VLAN trunk on your Vyatta. 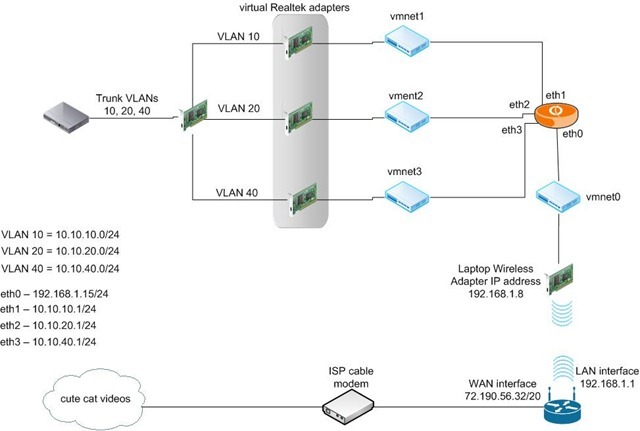 No need to add multiple network adapters to create separate networks. Thanks again for your comment and bringing back a goodie! Thanks for the comment. As mentioned in the comments above, you’re right – I’m not using VLANs on the Vyatta, but on the ESXi host portgroups (not shown). can you make clear one thing. you said you are using only a laptop with VM workstation on it. where did u install vyatta (on a VM or Hard disk or USB…) and how to run the vyatta router while using VMware at the same time? I installed the Vyatta virtual router inside VMware Workstation. I created a VM based on Vyatta’s recommendations first, then mounted the ISO image and installed the software on the VM. I’m sorry, but I’m not clear on your question of how to run the Vyatta and VMware Workstation at the same time. They’re not mutually exclusive. In fact, the Vyatta virtual appliance, by its very nature, depends on VMware Workstation (or some other hypervisor) to run at all. yes that’s what i meant. i got a little bit confused because i’m new to vyatta. i thought it has to be installed on the laptop itself. you did a great job over here. i’m preparing a test lab and i’m gona establish your setup. Thanks for the kind words. Be sure to read the comment section of this post because other kind strangers have shared corrections to the post. I hear that Vyatta open source has been retired by Brocade,Will this work with Vyos ? Before all I sincerely thank you for this EXCELLENT howtoo. It is very clear and thanks to it, I have been able to configure a small virtual lab, just more simple. On machine w2012tst1 I assigned ip address 10.10.10.60 with default gateway 10.10.10.50 and it worked perfectly! At this poin I’m stucked because I don’t understand how to change network configuration on w2012tst1 to make this work. 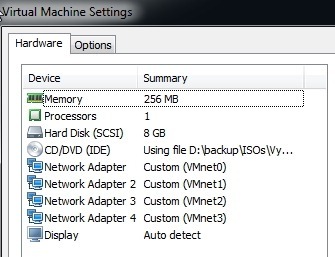 What vmnet should I assign to w2012tst1 (instead of vmnet10)? What default gateway? 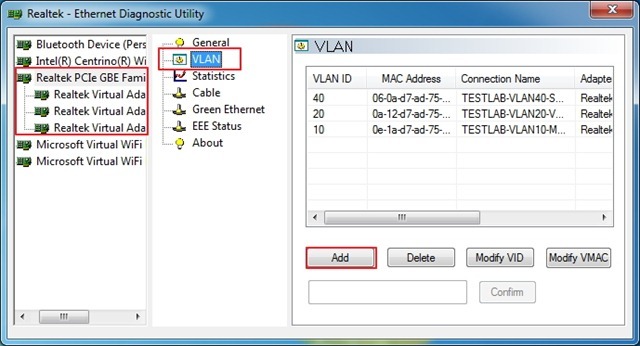 Should I configure vlan tagging within os??? To be honest with you I never played with VLANs thus I suspect that some big piece is missing in my understanding.